So, what is Anvil's Storage Utilities? First of all, it's a Storage benchmark for SSD's and HDD's where you can check and monitor your performance. The Standard Storage Benchmark performs a series of tests, you can run the full test or just the read or the write test or you can run a single test like i.e. 4K QD16. This is showing a screenshot made by clicking the Screenshot button in the application where I have just performed a full test of the Samsung 470 SSD. We'll walk through the main functions of the standard benchmark in the following screenshot. At the top of the app you select the size of the test, which drive to test as well as a menu where you can set the default preferences in the Settings menu option. To the right there are buttons for either running the read tests, the full test or the write test as well as the scores. Bottom left of the screen there is a collection of information about the OS, motherboard, processor and memory. Bottom right is a collection of information about the selected drive as well as the compressibility of data is used in the test. The compressibility option is of interest for drives using compression, like the SandForce based SSD's. Most of the information displayed at the bottom of the app is collected using WMI, the rest is found in the Registry. WMI is short for Windows Management Instrumentation and has been a part of Windows since Windows 2000. - WMI class missing for Windows XP. -Will now show if Volume is compressed. -Option for setting runtime length of MixedIO in ms.
-Display IRST version for 32bit OS. - Lists Intel Option ROM version. - Pause on Endurance test is now user configurable. - There is now a 500ms pause for every 500 files deleted. -ASU now requires Administrative rights. -TRIM can be triggered if TRIM is supported by the OS, will work on most drives that supports TRIM. -New setting for Enabling/Disabling testing with "Write-Cache Buffer Flushing" on the X79 when using the 3 series RSTe driver. Temporary test folder renamed from _AP_BENCH to _ASU_BENCH, the folder is at the root of the drive. In case the system shuts down and ASU is not able to clean up the test folder, the contents can be deleted. Make sure that you don't have any folders that are in conflict with the test folder. - Drive-name is now being displayed top right. - Changes to colors, more theme friendly. The color/theme changes might still need adjustments so feedback is welcome! Last edited by Anvil; 01-02-2014 at 01:19 PM. Last edited by Anvil; 07-27-2011 at 07:48 AM. Last edited by Anvil; 07-27-2011 at 07:51 AM. So, what does this test do? The point is that it creates a files at a random size just like we do in real life. First off, it has to be placed on the drive where the test is being performed. If you fail to do so it will run the Endurance test on the drive where the executable (application) is placed. Once the test is started it will create a TEST folder where all the files are held, so, make sure to copy the application to the drive where you are performing the endurance test. By clicking Start you will by default fill the drive until there is 12GiB free space left, you can change this by modifying the value found top left "Min GiB Free". Max # of files to create regulates how many files as a maximum to create per loop. Loops lets you set a specific count of loops unless you want the test to run "forever"
-perform random writes on a designated file, this file is not deleted between loops. You'll have to fill the drive with static data until there is adequate free space left. Last edited by Anvil; 07-27-2011 at 09:22 AM. Great to see it go live. A large improvement over AS SSD and CDM that a lot of people use these days. Well done! Have used it in the past few reviews and its a world away from the frustrations most had experienced trying to get through IOMeter. Its also good to be able to quickly test SSDs with different configurations of read, write or mixed IO to see where the best IOPS result can be achieved. Qute frankly, this is my favorite synthetic benchmark program. Great job Anvil and I think this software will do absolutely great. You might as well contact www.download.com for their inclusion right away. Please include the version number or date in the filename of the zip archive or folder in the zip archive. That way we do not have to download and run the app to find out if we have the latest version. I just tried it out. I would "Thank you" as others have if I knew how. Mixed I/O is a little known performance metric and it's great to be able to easily test this metric. Here are a couple of runs at QD2. (I've got a seperate instance of Anvils app running on the V3 at the same time, so could be that the results took a hit). It's a bit strange that it can't read or write more than 4MB during the sequential IO part of the benchmark, are there other tasks running on that computer? Could you try disabling real-time AV scanning while running one test? [strikethrough]It seems to skip the "Preparing the testfile" step[/strikethrough] Preparing the testfile step seems to be the issue (usually takes 15-20sec, but now it's taking 47-48ms). Oh sweet! Thanks for this program. Has a lot more function then some other ones. Mr. Anvil - Much thanks for a great app! This should become very popular, looks to me to be much better than ASSSD or CDM alone for sure. Mr. 1hz - wow - I suspect this is the high end scores for the bench for sure! Is this standard format or fast write format on the iodrives? Standard NTFS, 4K cluster windows softraid? I will post some benches - hopefully later today. Thanks to all of you and especially to the ones that have been part of the preview/beta, some for a couple of months and last but not least to the guys at TheSSDReview for hosting the download. There is a new build (Beta4) at TheSSDReview, it fixes a WMI related issue on Windows XP, it looks like some are still using the good old XP and the benchmark works just fine on XP with the new Beta. Standard format... The fast write format doesn't seem to do anything after they implemented TRIM. It used to reduce degradation, but now there isn't any to begin with so it is kind of useless in normal environments. stop buying iodrive and buy a house so i can move in. thank you. 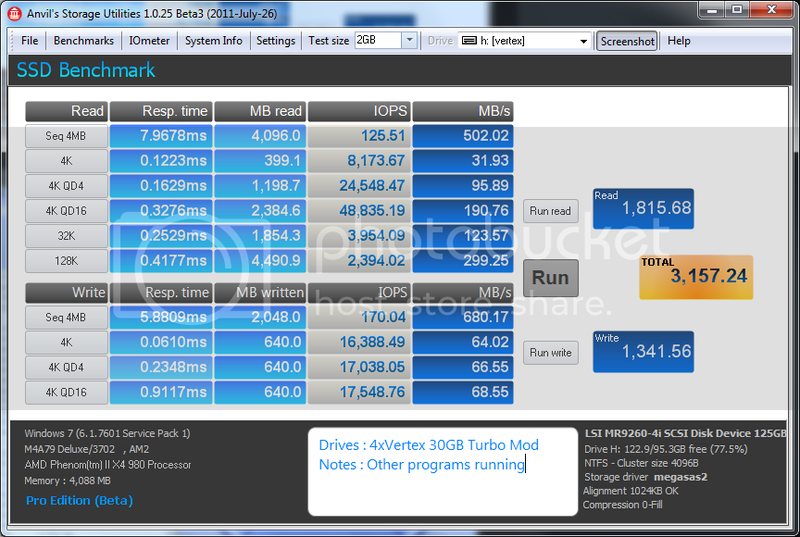 I'll try and start the Endurance Testing on that 64GB M225/Vertex Turbo FW drive real soon. Need to take some baseline screenshots first. EDIT: Is the "Stop" button wiper tool and then start again without loosing track of totals? EDIT 2: Nevermind. Figured it out myself, it still keeps track if you stop and restart (I didn't close app either) so I could run Wiper. No TRIM is killing me, first 2-3 loops run @ ~150MiB/s then drops to ~50-60 on loops 4-5 and on. Last edited by bluestang; 07-28-2011 at 11:04 AM.